early in July, at the Major Economies Forum (mef) meet in Italy, India signed a statement which created a major controversy back home. A few days later sparks flew during US Secretary of State Hillary Clinton's visit to India. Both sides stuck to their negotiating stands. By signing the mef statement India was seen to be giving in to the demands of industrialized countries (Annex I countries), the US in particular, which wanted major developing countries to take binding commitments to reduce emissions. Top climate negotiators agreed the statement was a compromise but it did safeguard the country's basic and critical positions. Besides, China, South Africa and Brazil--India's partners in UN climate negotiations--had also signed the declaration.On July 20, Environment Minister Jairam Ramesh corrected any ambiguity about India's position in a joint press conference with Clinton. Legally binding emission reduction targets will not be acceptable to India, Ramesh clarified. Two of the several points in the declaration sparked controversy. One: developing countries take action so that their emissions represent "a meaningful deviation from business as usual in the midterm"; and two: limiting global average temperature increase to 2C above the pre-industrial levels. The latter comes with a rider of identifying "a global goal for substantially reducing global emissions by 2050". This translates to all countries, developed or developing, to make drastic emission reduction by 2050. Short-term reduction targets for Annex I countries and the long-term global target for all countries are being discussed under two separate tracks in climate negotiations. India's, along with other developing countries', stand has always been that the Annex I countries need to deliver concrete and significant short-term reduction targets (within the next decade or so) before asking for global long-term action. 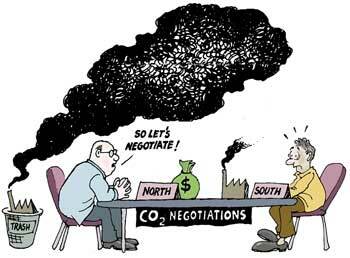 The Annex I countries are historically responsible for emissions and have the highest per capita emissions. Critics say by "recognizing" this long-term 2C global limit India may have made a major concession and has let off developed countries. Also the "meaningful" deviation from business as usual level could be construed to mean that major developing countries have to take mandatory cuts. Senior Indian negotiators argued mef's is just a political statement and not binding. They said accepting the 2C limit was a trade-off to accepting a 50 per cent global reduction target by 2050. A quantitative figure would have been worse and this compromise would not hurt India, they said. Ramesh furthered the stand during Clinton's visit. "There is no case for the pressure that we, who have among the lowest emissions per capita, face to actually reduce emissions. As if that were not enough, we also face the threat of carbon tariffs on our exports to countries such as yours," Ramesh told Clinton. He referred to the climate change bill, which the US House of Representatives recently passed. It proposes to impose tariffs on imports from countries, which do not reduce emissions by 2020. Clinton accepted developed countries like the US need to take the lead and that "US does not, and will not, do anything that would limit India's economic progress that is necessary to lift millions more people out of poverty". But she warned "because over 80 per cent growth in future emissions will be from developing countries" and Indian emissions are likely to go up 50 per cent by 2030 it is imperative India and China also take the lead. "Even with 8-9 per cent gdp growth every year for the next decade or two, our per capita emissions will be well below developed country averages," Ramesh said in a written statement. He also pointed to a "credibility crisis" and that the developing world looked upon the developed countries "suspiciously" as they have not fulfilled their earlier climate commitments. Clinton's visit did not yield much. The Indian business community was the biggest focus of the visit. The US delegation seemed to be looking at business possibilities in Indian emission reduction and selling clean technology to eager business houses. However, the US delegation did not make any financial commitments.